In my review, I found Grammarly to be one of the best grammar and punctuation checker tool. With zero learning curve, it is easy to use with 99.98% accuracy. Premium features like plagiarism checker and proofreader are commendable because Grammarly has a huge database of text to check your copy based on the type of its genre (medical, business, script, blogs etc). Try it for now with our official 20% discount. Grammarly Review Summary What is Grammarly? Detailed Review Who is Grammarly For? Grammarly Review 2019: Best Grammar and Punctuation Checker tool online? Let’s see! …only to find spelling mistakes and punctuation errors screaming to sink you below the earth? This is even worse if English is your second language (like mine!). However, there are tons of great hacks for checking spelling, grammar, punctuation online. And today, I’ll introduce one such revolutionary tool (Grammarly, it is) that can help you write faster and better without having to worry about comma placements or even plagiarism. Today, we’ll review Grammarly, which is yet another revolution in terms of writing better and correct English. It also has an inbuilt plagiarism checker and one of the best online proofreader tool which have rave reviews, but let’s not take that for granted. So, let’s have a thorough review of Grammarly (2019 edition) and see if it’s worth the cost! We’ll see if Grammarly is reliable or does it even work, all by testing ourselves and not reading those Grammarly reviews! To summarize, Grammarly is a perfect writing assistant for students, professionals and users whose primary language isn’t English. It helps you eliminate common grammar and punctuation errors. Grammarly isn’t a replacement for human proofreaders but is a good tool to polish your English writing. I’d give it a brilliant 9/10 rating. Grammarly is an online app that you can use to write directly or upload (or copy/paste) a previously written document to check for any grammatical mistakes. It also has a free chrome extension that sits under the hood of your browser and checks for grammatical errors when you are writing anything, literally (even your Facebook status updates, emails, and blog comments). Grammarly was launched in 2009 and is owned by Max Lytvyn, Alex Shevchenko. Since then, Grammarly has continued its journey to helping writers, bloggers, students and academic teachers write better and correct English. Grammarly Feature Overview: What are the best features of Grammarly? Grammarly is an instant grammar checker, and it has a plethora of features that can help you write mistake-free English no matter it is a status update or a blog post or an important school essay project. Helps create professional resume/cover letter. Check Out Grammarly In Action Here! Grammarly is not only a grammar checker tool but also your personal proofreader, your duplicate content detector, and your writing guide. Its mission is to help you write better and mistake-free English. It’s a handy spelling and grammar cheat sheet that covers everything instead of just a few rules. Teachers and university librarians who need to check student assignments for plagiarism. Students to get better grades with grammatical papers and better-punctuated assignments. Job aspirants wanting to create a professional and error-free resume/cover letters. Anyone with a flare to writing better English. I have been using Grammarly for a couple of years. Since English is my second language, I was terrible at writing my blog posts. After suggestions from many professional bloggers, I decided to give Grammarly a try and have never looked back again. Grammarly is not perfect. No machines or AI can be. But it helps a great deal to get almost 99% of those embarrassing grammatical mistakes and saves a ton of time proofreading blog posts. 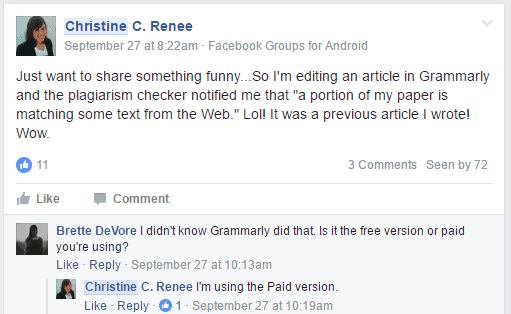 a) How To Use Grammarly Browser Extension? After you download the extension, log in to get your personalized dashboard. You don’t need to check the dashboard, as Grammarly icon sits at every text field you write and suggests you the errors. Step 1: Download the browser extension to kick-start the process. 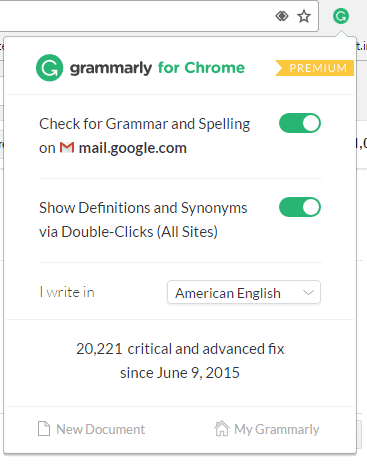 The Grammarly website can recognize what browser you are using, and it provides an option to download the add-on. Do it without thinking twice. b) How To Use Grammarly Web App? What do you think the Grammarly icon on the toolbar used for? Well, if you don’t like the live checking option floating over other websites, you can proceed to much more dedicated space using their web app. But you should be signed into Grammarly for using the extension. Step 1: To use the web version, just create a free account here. Don’t worry you can choose the free version while signing up. Step 3: There are two options at the bottom; one is New Document that lets you go to the Grammarly editor all at once. The other one is My Grammarly, clicking on it will bring you to the dashboard. (You can choose between American and British English as well). See it even spot the words I use more often. After the check, you can download the file in the same format with a click (see the marked button in the image). Grammarly will save the document in the download folder as filename.edited. c) How To Use Grammarly MS Word Add-in? If you’re a Microsoft Word user and wondering how to use Grammarly with MS Word, I’ve got your back covered. Grammarly does integrate with MS Office via a Word add-in, which you can download here. Other notable apps are Grammarly native apps like the Grammarly desktop software for Windows. You can download it here. This piece of software is helpful to use Grammarly directly from the desktop and outlook. Let’s now see how Grammarly aids in writing proper copy by correcting Grammar, spelling and punctuation thoroughly. If you think why bother a new tool when our traditional MS Word has all the spelling and punctuation corrector inbuilt, I’d say think twice. Grammarly is intuitive, and checks for your writing pattern corrects contextual spelling checker that would otherwise go unnoticed when using MS Word. For example, words like next and nest, affect and effect, lie and lay are too complicated for traditional word processors to detect. But, Grammarly has corrected 100s if not 1000s of such mistakes in my writing. When writing a long essay or even a blog post, we tend to use a word way too often than necessary. (In this article, I have overused words like premium, as detected by Grammarly)! These go unnoticed by us but not the reader and can cause huge loss of marks or impression. Correct grammar and punctuation are the backbones for getting better grades at universities, winning business proposals and jobs and even getting a date. (Yes, a research conducted by Grammarly proved 98% of candidates who used Grammarly while messaging were successful than their friends ). Grammarly points each error with red and green underlines, and when you hover over them, Grammarly highlights the error, gives a bit of info about what went wrong and then suggests the correct option. Grammarly plagiarism checker is by far the best plagiarism checker tool till date. Plagiarism is essentially the duplicate content in a piece of document (click here to read more about how to avoid plagiarism here). Detecting plagiarism is a big problem with many people especially writers and college authorities. Most colleges have this work done by librarians. In my hands-on Grammarly review too, I found Grammarly checks my document for any traces of copied content from over a database of 8 billion web pages. This is what makes it a perfect alternative to Whitesmoke and similar tools. Moreover, it displays the percentage of plagiarized content so that you can decide if it is ignorable or not. Grammarly’s online proofreading feature is a blessing for many like me who can’t afford a professional human proofreader. Grammarly’s proofreading adapts to our writing style (business cover letter/academic paper or a novel). By far the most trusted proofreader to create a mistake-free resume or cover letters. The automated online proofreader tool of Grammarly not only checks and corrects grammar and common mistakes like comma placements. It also detects plagiarism and if found, but it also generates citations in MLA, APA & Chicago. Grammarly is the most used online proofreader and grammar checker tool by millions of professional writers, business persons, and bloggers worldwide. See definitions and synonyms via simple double-clicks. Accessing my documents anywhere on the go. 6. Grammarly Pricing Review: How Much is a Grammarly Subscription For? Are you wondering if Grammarly is worth the money? The answer is, Yes and No. Which means, if you’re professional or someone who needs to be grammatically correct and create a good impression, no matter it be social media or business proposals or blog posts, Grammarly is worth every penny of the investment. Grammarly offers a free plan that is by far the best free online grammar and spell checker tool. Get your free copy here! However, if you are looking for advanced functionalities like plagiarism checker, MS Word add-in or the desktop software for Windows, you need to get their premium plan. It’s my vision of getting DigitalGYD readers the best they deserve, I have an exclusive Grammarly discount for DigitalGYD readers. The makers were kind enough to offer you a 20% discount off the price mentioned above. Click any button on this post to get your discount! NOTE: You only get the discount if you click on any Grammarly link on this website, not elsewhere. Grammarly has both free and premium packages so that it is accessible to everyone. It doesn’t give you information about your mistakes and doesn’t have the MS Word add-in. Grammarly’s premium version, however, contains other useful and advanced features like an extra 100+ grammar and punctuation error detection. Suggestions for improving your mistakes. It also has plagiarism detection software to check for copied content and the essential genre-specific writing style check. This is essential because not all the copy is equal. What may be correct for writing a blog post might be weird if used in a novel or a business cover letter. You can access the premium version by clicking here or visiting official website www.grammarly.com. Grammarly detects contextual mistakes, unlike MS Word. It is available on the cloud so you can access it anywhere. Checks for copied content (plagiarism). It literally sits on your browser and detects every single mistake that you make, corrects them and sens you a weekly report of your progress. There’s no one size fits all rule. If you don’t prefer Grammarly for whatsoever reason, I’ve got your back covered with some of the best Grammarly alternatives to aid you with your writing. Whitesmoke: Whitesmoke is cheaper than Grammarly and even if it doesn’t cater to all that Grammarly does with the same speed and ease of use. It has mobile apps and supports major writing platforms. One of the key reason for Whitesmoke being a strong Grammarly competitor is pricing. Try it here. ProWritingAid: ProWritingAid is by far the best Grammarly alternative you can find. It detects a lot of errors and even though anyone can use it, ProWritingAid is more focused towards creative professionals (writers, authors, script writers etc.). It is also cheaper than Grammarly and includes support for Google docs amongst others. Read my detailed ProWritingAid review or click here to claim your 25% ProWritingAid coupon to save money. Our Verdict: Is Grammarly Worth it? Grammarly’s proofreader feature including contextual grammar checking and punctuation errors is by far the best I have seen. The plagiarism checker has been a life-saver for content outsourcers like me and academic workers (college professors and teachers) to check for plagiarism or duplicate content in student essays/projects. Through my Grammarly review, I recommend Grammarly to anyone who has the need to write better for business/academic performance or simply who wants to learn better English on the go. In my review, I found Grammarly to be one of the best grammar and punctuation checker tool. With zero learning curve, it is easy to use with 99.98% accuracy. Premium features like plagiarism checker and proofreader are commendable because Grammarly has a huge database of text to check your copy based on the type of its genre (medical, business, script, blogs etc). Try it for now with our official 20% discount. I LOOOOOVE Grammarly! I consider myself very proficient with the English language, but I’m constantly learning more about how to craft better sentences, spell tricky words, or use punctuation properly. I didn’t know all of the wonderful things it was capable of on top of just the Chrome browser extension! I love Grammarly, it’s so helpful and makes me feel so much more certain that my blog posts aren’t full of grammatical errors! This is so helpful and informative. Thank you! I’ve heard such wonderful things about Grammarly! Wow – thanks for breaking this all down. I had a rough idea of this app but there’s a lot more to it than I realized. Thanks for all of this great info! I’ve been seeing so many ads for Grammarly lately. It seems like such a useful tool! This is a great post that shows all the reasons Grammarly is great! I’ve been a freelance writer since 1998 and I agree that this is the best tool available for writers and bloggers. A very well-written review! And I love the little effects and changes made to the blog as well! Yes, Grammarly IS wonderful, something that we use regularly and have also written about it on our blog, if you remember. I’d strongly recommend it to anyone, whether you are a blogger, writer, student, or anyone who writes!